As we prepare to put our house on the market and get ready for an eventual move, I have begun a serious effort to de-clutter. I have read that getting rid of one's materialistic mountain of stuff and living a more minimalist life is a freeing experience. And perhaps it is... for other people. But I am finding it very difficult. I am not by nature a big consumer. I don't finding shopping to be an enjoyable pastime. I keep things and use them until they don't work anymore, and when possible, repair them. I have a 5-year-old cell phone, a 35-year-old blender, and a 50-year-old camp stove. When we went on our 8-week camper trip last summer, I didn't miss any of the stuff left behind in our house. 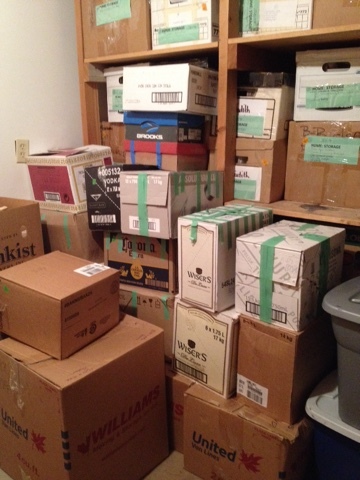 We have a storeroom full of boxes that haven't been opened since we moved here five years ago, and some of those boxes are from the move before that, 13 years ago. Someone said to me, "If you haven't felt a need for anything in those boxes for years and can't even remember what is in them, why don't you just throw them out?" Why can't I do that, and why am I finding it so hard to throw things away? Well, the answer is simple and complicated at the same time. Opening up those boxes and finding the items inside takes me on a sentimental journey. As I pick up and hold each item, I am immediately transported back to an earlier time in my life. The item, whatever it is, stimulates memories of people and experiences that, without the artifact, I would be unlikely to retrieve. And then I relive that memory. In one box, I found a painting of the Battle of Salamis that I did when I was in Grade 4. Looking at that painting, I remembered my Grade 4 teacher, a wonderful woman who wanted to ensure that her students had their eyes opened to the wider world through music and art. Her art class was not an afterthought. Each student in the class was required to bring to school a two-foot by two-foot piece of plywood. To one side of it, we stapled a piece of vinyl cloth, with the fabric side out. Propped up on the chalk ledge of the blackboard, that board served as a painting easel as we stood to paint. Fifty-one years later, I still love to paint, and I still stand at an easel when I paint. The teacher often tuned into CBC for a weekly radio program on art for children. The program began with a story of a historical event, such as Xerxes and the Battle of Salamis. At the end of the story, the narrator would instruct the students to paint a picture stimulated by the events in the story, and provide some tips. We would sit in our desks and listen to the program, and then stand at our easels and paint. For the Battle of Salamis, which was a naval battle between the Persians and Greek city-states, the narrator suggested creating the illusion of froth on the ocean waves by colouring on our papers with a white wax crayon before painting over it with our water colours. Looking at my childhood painting brought these memories flooding back. In another box, I came across the language diary that I kept for my middle daughter. I wrote down her first words by date, both phonetically and in standard orthography, and made note of the context in which they occurred. She began talking very early, and her first two words were "Mom" and "num-num" (she liked to eat). Her first two-word utterance, just as she turned one, was "Kate bye-bye." And I laughed to remember that one of her first fifty words was "beer." If we drank beer, we had to be careful to not to leave the bottles within reach or my baby would help herself to the dregs. I also discovered some of the handmade literacy books that I made for my children. I used to staple blank pages together to make a book, then write simple stories for them, and illustrate each page. When they were just learning to read, they could read aloud from their own personalized books that were about themselves, their pets, and their adventures. My children loved the books, and as they became older, they also made and illustrated their own books. One of the photos below is of a book that my middle daughter made and illustrated for her little brother. 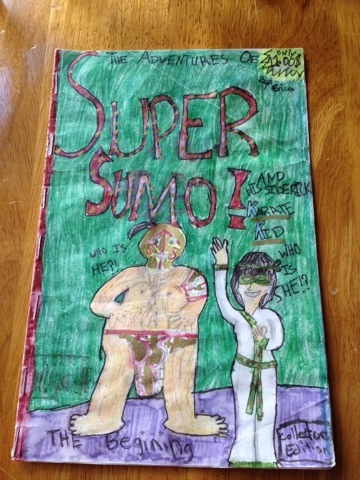 It is "The Adventures of Super Sumo!" 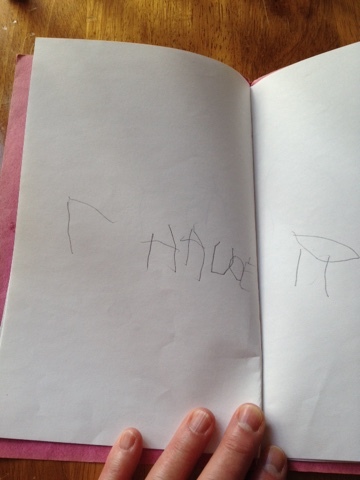 The other is of a book my son made when he was just learning to write. The word says "Chaucer," which was the name of one of our cats. My children also had several experiences of making or decorating pottery when they were growing up. Our city had a community arts day each spring when the public was welcomed for free into various art studios and could participate in art activities. One activity that we all loved was that of the Pottery Club. They would set up their raku pottery kiln outside on the lawn, and sell pieces of pottery that had been fired but not yet glazed. My kids and I would paint the pieces with glazes and then stand and watch as the potters fired the pieces for us. Once they cooled, we would proudly bring them home and display them in our house. Both my daughters participated in various art camps and courses. 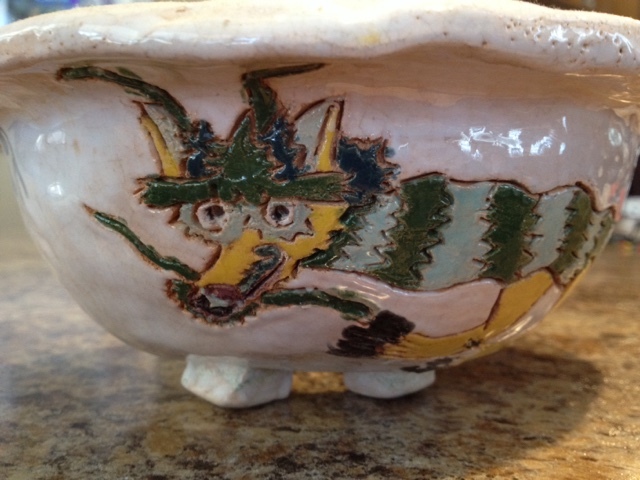 The photo below shows some details of a beautiful planter that my older daughter made for me. Although going through the boxes and trying to decide what to throw away has been emotionally exhausting, it also has been a wonderful, joyful experience. If I hadn't opened up those boxes to attempt to de-clutter, I would not have had the chance to take this sentimental journey. It is true that the things in the boxes are just objects, and to many people some of the items look like junk, but to me, they are saturated with meaning. My past life now has become memories, and those memories are springing back to life as I look at artifacts from my past. During the past two years, I have been on a journey of change. Unlike the kind of change emphasized throughout my career, when I facilitated external changes such as institutional change, theoretical advancement, system innovations, and learner change and development, now I am undergoing a transition that involves self-change. Of course, within my career, I experienced self-change through personal reflection, learning, and growth; however, I see in hindsight that those changes were in a narrow sphere. It was the sphere shaped by work requirements. I grew in areas that helped me to do my job better. Now as I prepare to leave my career, those matters and daily concerns that so engaged me have fallen away. My mind is no longer buzzing with job-related worries all of my waking hours. And what "me" is left after work goes away? Or, to put it another way, what kind of person will I grow into and become once my career has been subtracted as the dominant element of every day? I suppose the first step of self-change began well before I left my administrative role or made the decision to retire. The first step was recognizing that something was missing in my life. Although I had a vibrant successful career, and was so very, very busy, that busyness was simply papering over a yawning emptiness that I did not have time to examine. The harder I worked, the less fulfilled I felt. The busier I became, the more I felt my self dwindling and disappearing. And as I became less present, my job became less satisfying and meaningful. But, conscientious person that I am, I flogged myself to work harder, even as I felt less and less happy in the job. Gradually, I realized that I had to make a change. Bit by bit, I admitted to myself that the job was no longer right for me. I analyzed what the issues were, exploring factors such as the long hours, relationships at work, value mismatches, which aspects of work fed my soul and which crushed it, and so on. I had critical moments of insight, such as in one particular meeting where my hands were tied on a budgeting matter that would have a negative and serious impact on a number of staff; and another when I broke a bone in my foot and it failed to heal, in part due to my extremely long hours of work. I am not one who gives up on anything easily. I came to an awareness over a period of a couple of years that I needed to leave that administrator position. It took another year to decide to retire and leave my career altogether. Although, at this point, I believe that there still are some aspects of my work that I will continue to engage in after retirement out of interest rather than for pay. Presently, I am on a sabbatical leave from work. Initially, the leave was to serve as a period of time to make the transition from one work role to another. However, now that I have given notice of my upcoming retirement, it is serving as a transition to retirement. While on leave, I am still involved in some work-related projects; however, my time requirement for them is moderate and flexible. What this has meant is that I have gone from long exhausting days crowded with obligations to wide open uncommitted days. There is a lot of open space in my calendar, and few external requirements to structure my days. Always in the past, when I had flexible periods of time, I set goals and objectives and held myself to them. I created a structure to shape my time. I governed myself by the law of productivity. 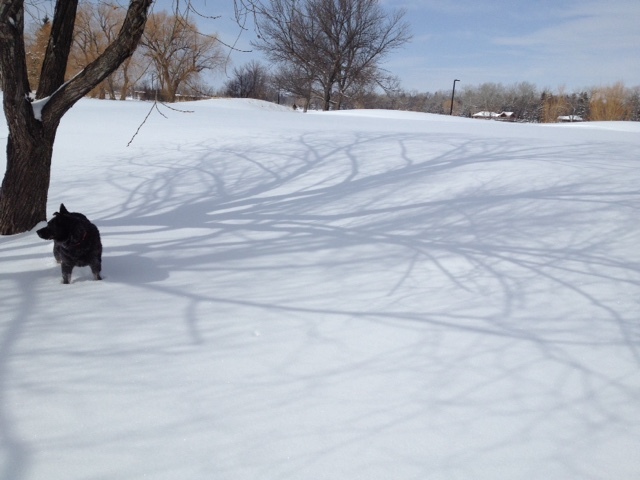 But in this voyage of discovery that I'm currently on, I am letting myself become comfortable with the wide open space. I am letting time be, rather than dicing it up into "to do" lists. But this does not mean that I am doing nothing. Rather, I am doing things that invite the lost and battered aspects of my self to re-emerge, and that allow me to re-engage with non-work (e.g., creative, social, and health) aspects of life. With Rob, I'm also doing the planning and practical things necessary for us to move away and move on. The first step as I started my leave was to rest and recover from a state of burnout. I was exhausted. I slept 9-10 hours a night. I had no energy for mental tasks and no physical stamina. For example, I struggled to make even simple decisions, like which restaurant to go out to for dinner, and to form logical arguments, and with word-finding. Recently, I was thinking back on that time, and an image came into my mind. It was a small stick figure of myself, crouched down in an angular pose, made of burnt matchsticks. Literally burnt out, expended, nothing but a blackened carbon skeleton of myself. Gradually I have added physical exercise into every day. I walk, ski, hike, bike, or do yoga almost daily. I have time now to focus on healthier eating, and take more pleasure in planning and preparing nutritious meals. I have taken the time to follow up on medical concerns. Yoga is new for me, and I enjoy it very much. Recently, I have begun to explore meditation as a practice. During my leave, we have done some travelling within western Canada, and have been able to spend large chunks of time with our kids and grandkids, other family, and friends. We also keep in touch by phone and through social media. It has become clear to us that living closer to family and friends is a high priority for both of us. We have keenly felt the absence of a strong social network in our current location. I have spent time writing. I have started a new novel and written about half of the first draft of it. I have begun writing poetry again. And I have written more regular posts on this blog. As well, I have continued with my oil painting, and currently am taking a watercolour class. I have done a great deal of reading in areas related to my career and those work projects. I spend quite a few hours every week on the projects. I also have had more time to attend local talks and workshops in areas of interest. The practical steps leading to a new life have revolved around discussing, planning, and taking actions to move back to our home province. As I wrote last week, we are in the middle of a renovation project and after that is done, we plan to put our house on the market. This process also involves decluttering, winding up things here, renewing my financial plan, and setting meetings with realtors and so on. I think that I am just at the beginning of re-imaging a new life. I don't know what shape that life will take. Rather than making a bunch of plans and implementing them, instead I am looking at it as a discovery. I am preparing the soil, throwing out a few seeds, and waiting to nurture whatever pops up. We are living in the land of dust. Dust in the air, dust settled on every flat surface -- kitchen counters, appliances, window sills. Dust in the nose; dust in the mouth. We try to wipe it up, and there it is again the next day. We are having the main bathroom in our house renovated. We have hired a contractor who did some work for the neighbour next door. It turns out that he is also the brother of the neighbour across the street. We are surrounded by neighbours in our own age demographic who grew up on this street, and now have moved back into their childhood homes, either with their aged parents, or after their parents have passed away. 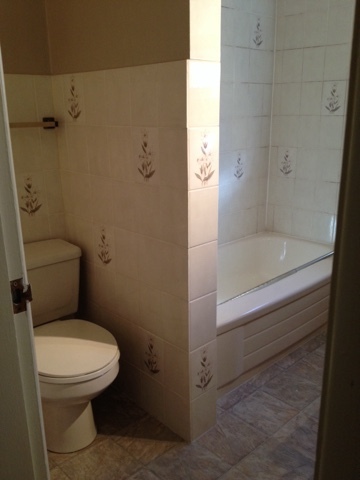 The previous owners of our house had done some significant renovations before we bought the place: in particular, the kitchen and the ensuite bathroom, and repainting throughout. The house has a huge contemporary kitchen with stainless steel appliances, island, and breakfast bar. It is a joy to work in, and certainly caught our eye when we were house hunting. The four-piece ensuite also is very attractive, with a huge shower, and also a soaker tub (great for après ski). But the main bathroom was very dated and rather grotty. The shower tile was chipped and cracked, and looked like it was from the 1970's. The bathtub and faucets might have been an original installation from when the house was built in 1959. So we took the plunge a couple of weeks ago. Our timing was perfect, as this is a slow time for trades in our area. We have had a steady parade of tradesmen traipsing through the house, knocking out the walls and removing the fixtures from the old bathroom, and doing electrical work and plumbing. Whenever you do reno's on an older house, you can expect some surprises. It turned out that the walls in our bathroom were lath and plaster -- much harder to remove than the gyp-rock of today's houses. The plumber replaced a sink drain pipe of galvanized steel that was 80% plugged (which involved some reconstruction in the basement). And the bathtub faucet had been leaking into a pony wall, which required replacement of a two-by-four. We decided to put in a second light above the tub. Today the drywallers are here, putting in the walls. Everything has gone along very well. 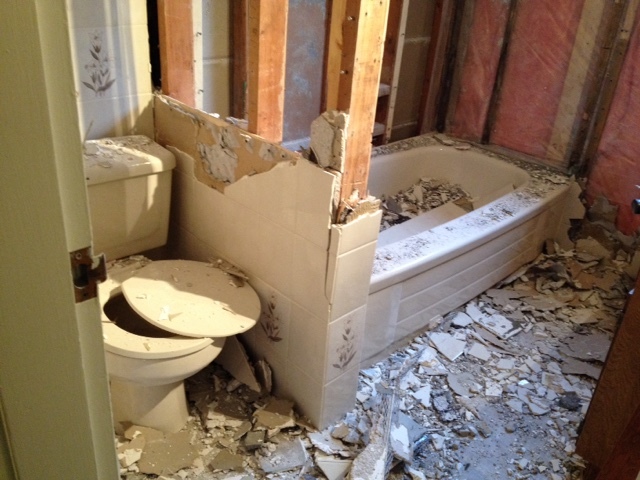 While we are having this work done, we decided to have top end dual flush toilets installed in all the bathrooms. As well, we asked the painter to do some repainting of some of the other rooms. So we now have a freshly painted master bedroom, my son's bedroom, and kitchen. I have never hired a painter before, but rather have always taken the do it yourself route. He is so fast and proficient! He completes in two or three hours what would have taken me two or three days. And it's all done with far less angst and no splatters. Yesterday, we went and chose the tile for the new bathroom. That was a fun part. So far, I am very happy with this renovation experience. 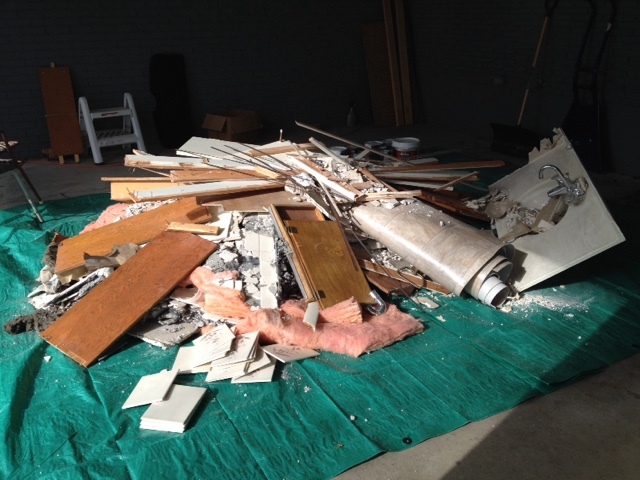 Although I had forgotten about renovation dust, at least it is going to be for just a short period. I think sometimes it is worth spending the money to get skilled tradespeople to do the work.